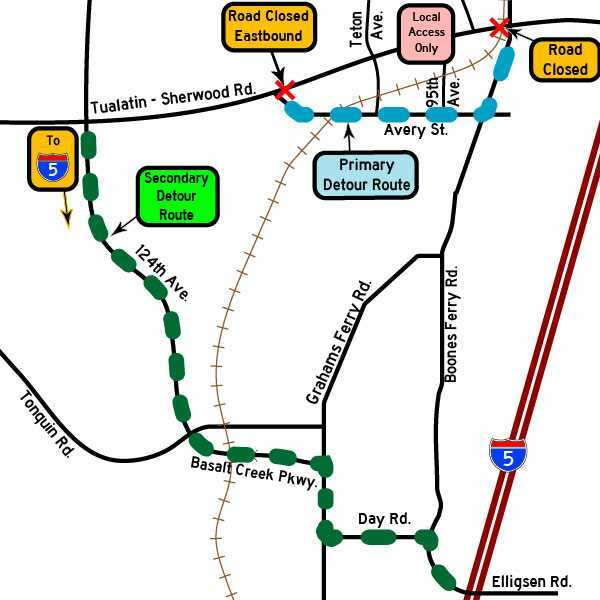 Tualatin-Sherwood Road will be closed to all traffic west of Boones Ferry Road from 8 p.m. Friday, May 17, through 5 a.m. Monday, May 20, for Portland & Western Railroad replacement of the railroad crossing. While the most significant traffic impact will be east of Avery Street, all traffic along Tualatin-Sherwood Road will be affected. Local traffic will be allowed to access Tualatin-Sherwood Road at Teton, 97th, 95th and 90th avenues. The railroad will have flaggers onsite for the duration of the closure. Washington County Department of Land Use & Transportation will be adjusting traffic signal timing in the immediate vicinity to limit congestion as much as possible. "We're asking people to plan ahead," said Stacy Shetler, LUT Traffic Engineering Manager. "PNWR is doing everything possible to minimize traffic impacts. However, delays and detours are unavoidable. Consider alternate routes and/or anticipate longer travel time." For updates, visit wc-roads.cocm and [email protected] #TSclosure.